Ultimate Family Gift Set Bundle! Includes 4 Ogo Sport Mezo OgoDisks, 4 Ogo Soft Balls & Exclusive "Matty's Toy Stop" Mini Aero Football! Invest in your child's health and mind with this hand trampoline for balls - throw, catch, bounce! Mini flies the farthest and its small target area increases difficulty. Bounce any ball. For summer fun, try it in the pool with water balloons! The Mezo OgoDisk is the winner of the Parents Choice Award and the TDmonthly's Innovation Award. Includes two bright blue and two OgoOrange disk with four OgoSoft ball & an exclusive "Matty's Toy Stop" Mini Aero Football. For ages 3 and up. 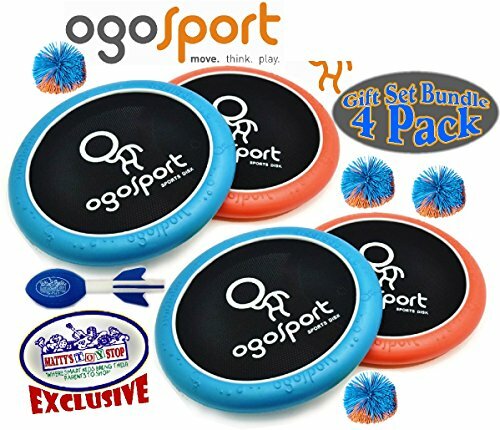 Gift Set Bundle Includes 4 Ogo Sport Mezo OgoDisks, 4 Ogo Soft Balls & Exclusive "Matty's Toy Stop" Mini Aero Football! If you have any questions about this product by OgoSport, contact us by completing and submitting the form below. If you are looking for a specif part number, please include it with your message.